Apple has replaced Coca-Cola as the top brand in the world, ending its 13-year reign as No. 1 on the annual Best Global Brands list. The iPhone maker’s value far topped that of Coca-Cola — $98.3 billion compared to the soft drink maker’s $79.2 billion, according to the study released by New York-based branding and consultancy corporation Interbrand. “Every so often, a company changes our lives—not just with its products, but with its ethos. 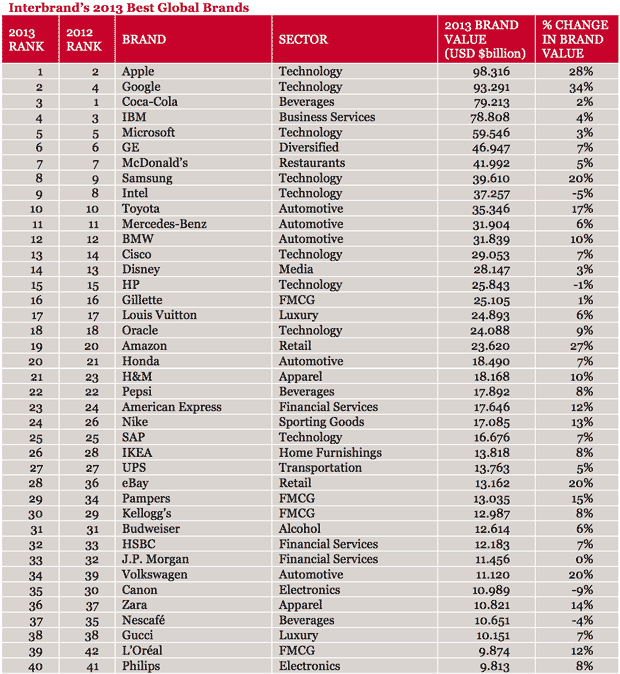 This is why, following Coca-Cola’s 13-year run at the top of Best Global Brands, Apple now ranks No. 1,” says Interbrand Global CEO Jez Frampton in a press release. Apple, which took the No. 2 place in 2012, is not the only technology company to surpass Coca-Cola. 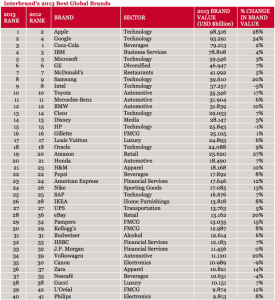 Google took second place on the 2013 global brand list, up from No. 4 in 2012, with a value of $93.3 billion, relegating the beverage firm to third place.